Diggers plow through the burning refuse. 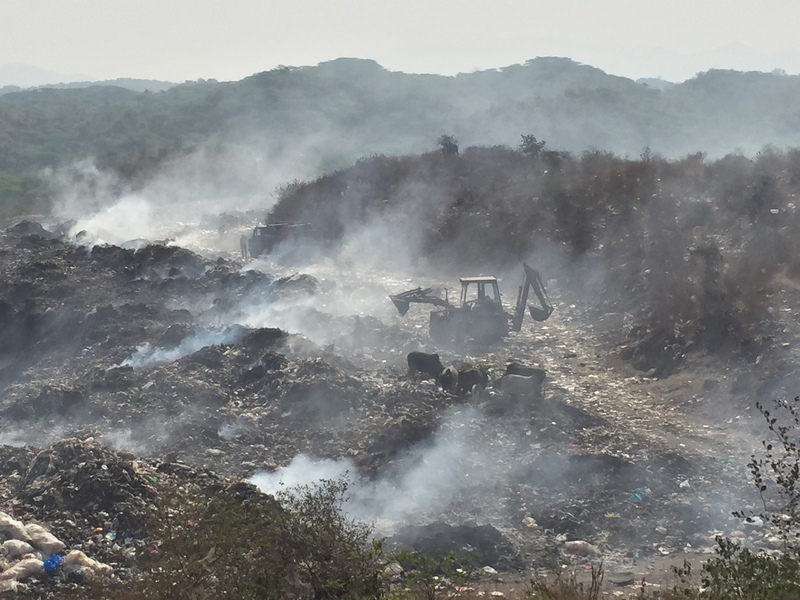 On day six of our CERES Global Sustainable Development, Permanent Culture and Un-learning tour to India we visited a municipal waste dump on the outskirts of Udaipur. Dump sites are always the dirty little secret of industrial development and commerce. They are the hidden landscapes of every city, a landscape so toxic and forbidding to life. In the Udaipur dump site, however, a community of “rag pickers” live and work in the mounds of refuse, earning a living from picking and selling recyclable materials from the waste piles. Our engagement with children from the rag picker community brought up confronting questions about environmental justice and our culpability of those of us with economic privilege in creating these poisonous landscapes through our consumption choices. The Udaipur dump site resembled how I imagined Mordor to be when I first read Lord of Rings (before the movies came out). Tree-less mounds of fetid-smelling garbage, buzzing with flies, covered in a plume of haze from the methane fires burning at various places across the site. Sites like these produce significant amounts of highly-flammable methane gas through the anaerobic decomposition of the waste. As well as fueling smouldering fires across the site, methane is a more potent greenhouse gas than carbon dioxide. The piles included all kinds of detritus of human consumerism, from food scraps to clothes to highly-toxic e-waste. Some of the refuse had been imported from other countries, in a nefarious trade pattern seen across the world where developed countries with tighter environmental regulations abdicate responsibility for their waste products to developing countries to take care of. I made a conscious effort not to cover my nose and mouth as we walked through the piles, wanting to feel the everyday sensory experience of the rag pickers walking along with us. The longer we were there, the more claustrophobic I felt. It was not any confined space that created this claustrophobia for me, but rather the feeling of an envelope of toxicity enclosing itself around me the longer we were there. I am well-traveled and have been to all sorts of challenging places. This place ranks up there among the most uncomfortable; the whole time we were there I felt a strong compulsion to get out. Nonetheless, one had to marvel at the resourcefulness of the rag picker community. We were told that pickers could earn 400-700 rupees a week from scavenging for recyclables. Our Shikshantar hosts introduced us to a group of kids from the rag picker community and invited them to participate in some games with members of our group. This interaction felt a bit forced and I wondered from the body language of the oldest boy playing games with us (looked about 13-14) whether he found it a little patronising to be playing kids games with a bunch of white people from overseas who clearly found his natural environment repulsive. While our hosts did provide a food donation to the rag picker community, how invasive was our presence to that community? How did the rag picker community members see us? More fundamentally, how are our consumption patterns supporting a transnational trade network of refuse that creates places like this? It was important to have this challenging engagement and have to confront these awkward questions about ourselves. Our group surveys the dump site. Photo: Helen Bucknell. Walking through the acrid smoke. Photo: Helen Bucknell. Rag pickers searching for recyclable materials. Photo: Helen Bucknell. Members of the rag picker community watching our group. Photo: Helen Bucknell. Fly-blown refuse. Photo: Ben Habib. A cow warming itself on the pile. Photo: Helen Bucknell. A sobering image of life on the site. Photo: Helen Bucknell. Our group coping with the smoke. Photo: Helen Bucknell. A cow sorts through the refuse for food. Photo: Helen Bucknell. Shelter under a rare tree on the site. Photo: Ben Habib. Upon our return from the dump site we were led through a powerful reflective meditation by tour-mate Sebastian Restrepo Henao, who prompted us to reflect on our physical, emotional and intellectual reactions to the dump site. Sarah Gorman then led the group through a discussion of the spatial dynamics of waste management through the lens of social permaculture zoning. Social permaculture draws on the permaculture ethics and design principles to create regenerative social relationships and communities. Social permaculture zones can be visualised as a set of concentric rings symbolising social and community relationships at different scales, from the inner landscape of the individual through to the global level. Social Permaculture Zones. SEE: Looby Macnamara, People and Permaculture, Permanent Publications, 2012. Using the social permaculture zones model, Sarah prompted the group to brainstorm different waste management strategies at different scales. At the level of the inner well-being of us as individuals (Zone 0), we identified the nourishment of our emotional and psychological well-being as critical to creating lifestyles that produce less waste from escapists pursuits. At the level of individual action, the group identified education and awareness of best waste management practice, coupled with conscious consumption, as strategies for reducing our waste footprint. When we locate ourselves as members of a household or workplace (Zone 1), the group identified composting, recycling, and household production of consumables as waste reduction strategies. Things get more complicated when we move beyond the household to neighbourhood-level scale (Zone 2), as coordination of waste management becomes a complex collective efforts involving many different stakeholders as moving parts in a larger system. Here, the Transition Network was mentioned as a model for community-led waste management coordination, particularly for things such as green waste which have value as nutrients that can be cycled back into productive use in gardens. However, most waste management at the neighbourhood and up to the city level (Zone 3) is coordinated by municipal governments, with engagement from waste management companies. It is at this level that municipal landfill sites like the one our group visited outside Udaipur are coordinated. Our local councils of Moreland, Darebin and Banyule in northeast Melbourne, for example, have excellent waste transfer facilities that sort waste into streams for recycling and re-use. To cite a different example from China, a 2016 La Trobe University and CERES Global trip led by Ben Walta and myself visited a waste-to-energy transfer plant outside Chongqing, where municipal waste is loaded into a huge hermetically-sealed chamber. Liquids are leached from the chamber and toxins removed, leaving water that is used to irrigate nearby farmland. Gas from the chamber is used to power turbines that produce enough electricity to power 200,000 homes on a daily basis. The hard waste is then passed into a furnace where it is burned to ash. The different grades of ash are then sorted and used as feedstock for different industrial applications, including asphalt for roads. There are no facilities of this scale operational in Australia. 3D model of the Sanfeng Industries waste-to-energy transfer plant outside Chongqing. Cooling tower of power plant, driven by gas from waste. Gas-fired electricity turbine, driven by gas from the waste. Zone 4 relates to bioregions and it is at this awkward scale that governments traditionally find difficult to coordinate. Bioregions are geographic spaces of common geology, soils, climate, flora and fauna, which often cut across political boundaries and jurisdictions. The incongruity between bioregions and political jurisdictions makes bioregional governance particularly problematic, as we know from the politics of the Murray-Darling Basin in Australia. Nonetheless, bioregional environmental governance is an area in which improvements need to be made to address environmental issues at scales beyond the local. It is at the national level (Zone 5) where government policy can make a big difference. Government waste policies and environmental laws can be shaped by social movements agitating for political action, and market signals driven by consumer behaviours. At this level, business can adopt best practice out of compulsion through government policy or through manoeuvring for market advantage. At the global level (Zone 6), we see the interaction between the global economic system of trade and finance that is the engine of the economic production that creates waste as its end product. It is at this level that we see the awful trade (transfer) of waste and refuse from developed to developing countries, where developing countries become the ultimate repositories for developed world pollution. It is also at this level where international cooperation takes place through numerous environmental treaties, where social movements, market forces and education combine with government foreign policy to shape transnational action. The social permaculture zoning concept is powerful because it helps us identify ways in which we as individuals can make positive contributions across different geographic scales. It can help us see how our individual choices can have an impact, positive or negative, on pollution in places in other countries like the dump site in Udaipur. Today’s engagement at the dump site prompted our group to consider our culpability and responsibilities as relatively privileged people nested within a global waste system, through an emotional and confronting engagement with a community of people who live with the ultimate responsibility for the end-products of that waste system.